The first time I had Tortilla Espanol was in Madrid. 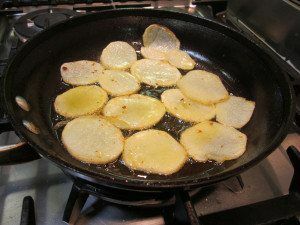 It is potato and onion sliced thin and slowly cooked in olive oil until tender and rich. Mixed with eggs and pressed into the pan to form a thick, tender, crust-less potato “tart”. 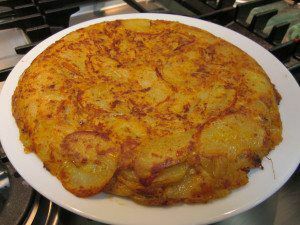 Although each tapas bar has their specialty they all have Tortilla Espanol. Your fork slides through the 2” tall tart with ease. 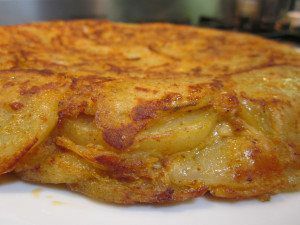 As you take a bite your mouth is filled with the creamy texture of the potato, the tender slices of onion and the occasional tender nugget of chorizo. Use a great extra virgin olive oil because it is a prominent flavor as it permeates the dish brining all the flavors together and keeping the tart moist. The paprika and chorizo give the layers of potato a beautiful red tinge. I love to make one of these and leave it on the counter for everyone to do a drive-by taking an occasional slice throughout the day. It is perfect for parties as well (that is why I made it yesterday, Lakers viewing party at a friend’s house)(for those of you who know me I was much more into the cooking for the party than watching the game). It is really easy to make (although a little time-consuming) and you. can customize it as you like. I added chorizo and smoked paprika to this one. In a non-stick skillet over med-low heat add a few oz. of raw, ground chorizo. Cook for a couple of minutes breaking up meat. Remove and place in a bowl. You will have brilliant red oil in the pan now. Add a Tb of really good extra virgin olive oil to the chorizo juice. Add about two cups of thinly sliced yellow onions. Cook low and slow until softened but not colored. Place onions in a colander with another bowl below to catch the oil. Add the onions to the chorizo and put the oil back in the pan. Add one layer of thinly sliced, peeled russet potato at a time and cook until tender but not colored (about three potatoes total). Add olive oil as needed. You are almost simmering the potato in olive oil. Drain the potatoes collecting the oil and adding it back to the pan for the next round of potato. Once you have all the potato and onion in the bowl with the chorizo whisk three eggs in a separate bowl. Whisk in a tsp of smoked paprika, ½ tsp white pepper and a tsp of kosher salt. Add egg mixture to potato onion mixture and mix together. Pour the mixture back into the heated non-stick pan and press the mixture down into the pan. Cook on med-low for about three minutes. Using a plate carefully flip the mixture over onto the plate and then slide it back into the pan to cook the other side. Press the mixture down into the pan again. Cook about three more minutes and then turn out onto a platter/plate. Let cool and slice. Great served with sliced, salted tomatoes and parsley. This is great at room temperature, color or heated up. You don’t have to go to Spain to enjoy some killer Tapas!